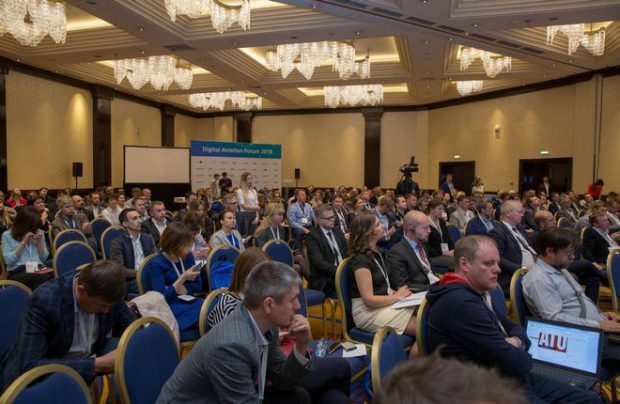 On May 31, Moscow hosted the 11th International Digital Aviation Forum which gathered more than 280 CIOs and experts of airlines, airports, business divisions of OEMs and travel agencies, IT-companies developing solutions for aviation. Being held for the 11th time by Infomost Consulting company, the Forum has significantly widened both its program and format. This year, brilliant performances by the speakers gave the participants an opportunity to dip into technological future of traveling, besides the attendees had a chance to visit the Digital Aviation Hackathon where young teams developed cases and competed to find out the best among them, as well as to join showcases and workshops organized by partners of the Forum, dive into the world of cutting edge technologies in the demo-zone and get familiar with advanced startups in the traveling industry. The first session devoted to digital transformation and technological trends kicked off with a presentation by Christian Baillet from Amadeus, the Forum’s general partner. Christian talked about global digital transformation with major focus on travelers’ values. The session continued with the presentation of Boris Padovan from Travelport who emphasized the importance of digitalization in the air transport sector today, as more than 30% of the world’s population is ready to give up seeing their friends in person for a possibility to continue using their smartphones. Dieudonné Kamaté from SkyLights pointed out that future belongs to VR-technologies – besides entertaining onboard they are able to smooth over the stress from the flight and boost passenger traffic. Andrey Sinkin, head of Development Directorate of FSUE ZaschitaInfoTrans of the Russian Transport Ministry also delivered a presentation and touched upon the new digital platform of the Russian transport system. The participants got to know about the key steps on creating and developing an integrated digital multimodal transport and logistic environment in Russia using home-built solutions and software. Presentations by tech companies was followed by a discussion which allowed such airlines as Belavia, Nordavia – Regional Airlines, RusLine, Ural, UTair to share their experiences on introducing new technologies. Gary Anderson from Rockwell Collins also emphasized aircraft digitalization. All airborne equipment of next gen aircraft can be fully integrated into a unified data exchange system which in its turn will be hook up with the ground-based network, he pointed out. Sergey Krainiy from SAP shared his view on what the new GDPR regulations would bring to the market and that non-compliant companies, regardless of country of origin and operations, might face significant fines up to 20 million euros or 4% of annual earnings. Danil Fomenko from the New Studio of Sirena-Travel talked about e-commerce trends for airlines. Roman Lopatko, senior director of Connected Aircraft Strategy at Honeywell elaborated on big data issues and demonstrated actual cases of how Big Data and advanced analytics may help a company avoid breakdowns and retain its customers. Sergey Tsymbuk from Longest Chance Limited told the audience about the pilot RFID project in the Sochi Airport. After separating the Forum into streams, Dmitry Krasnov from SITA opened the session titled Revenue Stream and Cost Reduction Channels. His presentation was devoted to artificial intelligence experience in managing unexpected flight schedule changes. Dmitry shared preliminary conclusions of the experiment – the applications of AI in aviation is an inevitable process and provide an invaluable contribution to the industry, besides feature engineering is of utmost importance, all that sparked a lively interest of the audience. Alexey Shubenkov, commercial director in Russian and CIS, Sabre Airline Solutions, taught how to stay ahead of the game in a highly competitive environment by using groundbreaking technologies and new solutions. The session was then followed by presentations and discussions for airports: biometric technologies, IT-services contributing to the commercial growth. Within the parallel stream devoted to traveling of the future the attendees learned how to assess the demand and travelers’ behavior as well as got to know about the potential of digital onboard platforms. David Rutnam from IATA talked about NDC and building company’s sales. The topic continued in the format of a panel discussion and triggered a keen interest among the participants including Konstantin Demanov from Aeroflot – Russian Airlines, Grach Muradyan, head of IT-projects at Amadeus, Svetlana Pankova from Travelport, Vladimir Proskurin from IATA and Alexander Sizintsev, director general of Biletix.ru. The Forum culminated with the award ceremony for Digital Aviation Hackathon teams and a reception where the participants enjoyed informal atmosphere after the intensive day program. The attendees shared their impressions about the Digital Aviation Forum – 2018. The event was organized with the support of the Russian Association of Air Transport Operators and the International Airport Association. Amadeus became a general partner of the event. The list of sponsors included Rockwell Collins, Sirena-Travel, SITA, Travelport, SAP, Sabre and RAMAX.